It’s not a 100% safe, or legal way to make a point. But I thought it was important enough, and that this is a critical moment in which to make this point. The Federal Renewable Energy Commission (FERC) is the agency in DC responsible for regulation of our interconnected electricity grids, as well as review, permitting and (almost always) approval of natural gas infrastructure in the United States. It’s already a powerful agency that oversees billions of dollars in infrastructure and is empowered to act on matters that can affect your monthly utility bill, and even seize your house or land and evict you through a process called eminent domain. 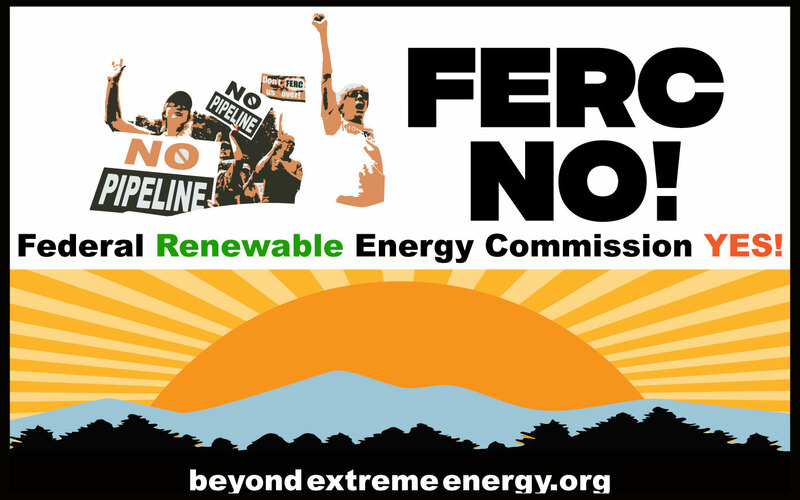 Allies of the fossil fuel industry in DC have fought for years to expand those powers – so that FERC would oversee oil pipelines too, and would have stronger and more expedited powers to force through fossil fuel infrastructure. For years we’ve battled against FERC and those who want to expand its powers – We’ve fought FERC orders to expedite fracking and new pipelines and LNG terminals. And we’ve been arrested and protested at multiple Senate hearings on FERC and opposed legislation to expand its powers. But all along we’ve maintained it doesn’t have to be this way. FERC has a clear set of responsibilities that could be really helpful in fighting climate change – they could direct utilities to price renewable electricity more favorably than fossil fuels. They could also stop approving every new fossil fuel project that is proposed to them – especially big new fracked gas pipelines and export terminals, which will lock us into dangerous methane – a climate pollutant 86x more powerful than CO2 – for 30 years or more. Hence – FREC, the Federal Renewable Energy Commission. Our vision is that as part of a Green New Deal, Congress would re-make FERC into an agency that prioritizes the climate crisis and acts to implement the renewable energy future we wall want. It was even starting to work – In the last 12-24 months we’ve seen cracks between the FERC commissioners, with the two Democrats dissenting on many votes and deadlocking – effectively blocking – approval of new pipelines and gas export terminals. When asked why they are saying no, Democrats at FERC say they hear from the courts, the public, and from scientists that they need to do a better job measuring and addressing the impacts these projects have on climate change. Fossil fuel companies should be paid more than any other energy sector. If ratepayers disagree, or the market simply moves in a different direction since the fuel for renewable energy is free, the Government will subsidize fossil fuel companies and force you to pay more money for dirtier energy. If fossil fuel companies want to build a pipeline through your town, put a compressor station on your front yard, or an export terminal where you fish, they can do so. Their wish is your command and they can take your land, your tribe’s land, or your town/state’s land to do it. If you think that’s unfair, you don’t want a pipeline in your front yard or sacred places, even if you take the time to convince your city council, tribal council, governor, mayor or other elected officials to join you in opposing the project, they will all be overruled. What’s yours, what’s sacred, what belongs to all of us in common – none of it matters. The fossil fuel industry gets what it wants, and you -as a ratepayer and a taxpayer – will pay them for it whether you like it or not. If you’re a shareholder, an investor, or a capitalist of any kind that believe climate change is a real, urgent threat – companies are ordered by the FEC to ignore you, and your right to talk about climate chaos, fossil fuels and investment strategy that does not burn the planet down is blocked. If you try and speak out anyway, your status as a licensed investor can be challenged and you can be removed from public exchanges. Fossil fuels are the only way to make money, and any dissent will be punished. Oh and if you resist, if you lay down in front of the machinery of destruction and put your body on the line to stop this madness – you will be arrested, probably by heavily armed federal agents, and put in jail. In an increasing number of states, simply praying for peace in the path of a pipeline could get you locked up for a decade or longer. 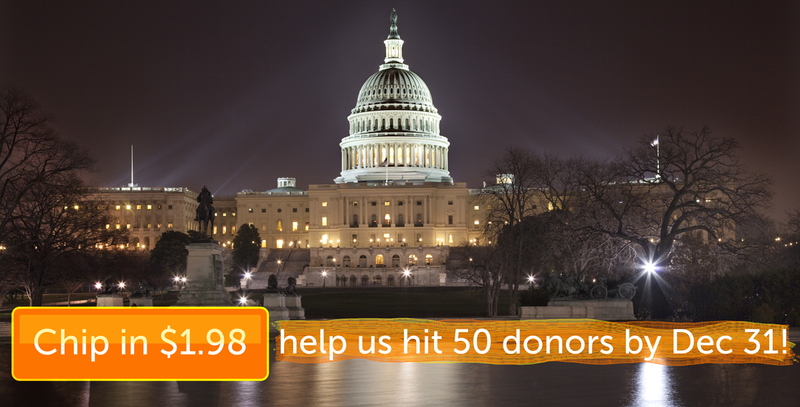 If you’re interested in supporting our work, click here to chip in – we have more actions planned this spring at Shareholder meetings and corporate gatherings! Call Chuck Schumer at 202-224-6542 and Nancy Pelosi at 202-225-4965 to urge them to support legislation to replace FERC with FREC. As you probably heard by now – Bernhardt was confirmed by a vote of 56-41 last week, over the objections of nearly 200,000 of us who signed, called, texted, and petitioned to oppose his nomination. The vote was largely along party lines, with three of the same Democrats who voted against the Green New Deal — Joe Manchin (D-WV), Kyrsten Sinema (D-AZ), and Martin Heinrich (D-NM) — voting for Bernhardt, as well as Maine’s so-called Independent Senator, Angus King. It’s frightening, of course, to have such a dangerous and dirty nominee confirmed to an important post that oversees so much of our public lands and waters, as well as many of the US Government’s interactions with tribal nations and indigenous people through the Bureau of Indian Affairs. But Bernhardt didn’t get away scot-free: He takes is official position under more investigations than most previous Interior Secretaries ever see. And House Democrats will be sure to scrutinize every corrupt rule and racist policy Bernhardt tries to promulgate. 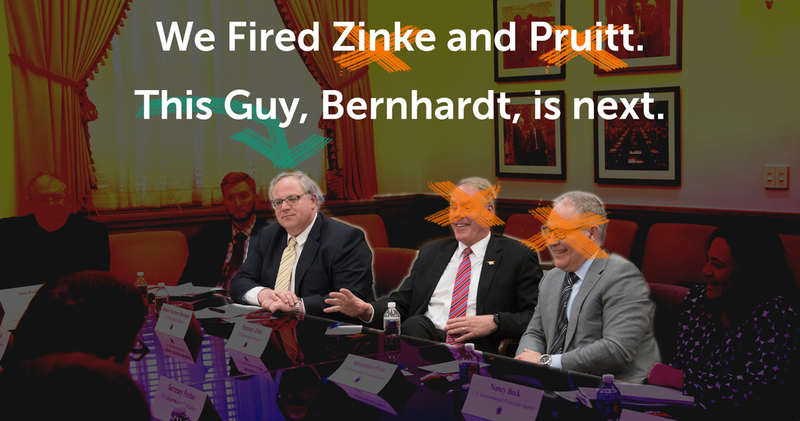 That’s the power of our actions together online – some bad things we can stop outright, and others, like Bernhardt’s nomination, we can slow and make more problematic for the drillers, frackers, and fossil-fueled cronies Trump appoints. So thank you for taking action. I also want to remind you that this isn’t over – nor is it the only thing we’re fighting right now. For those of you who are new to this list – Welcome! The thesis idea here at 198 methods is to use the anti-authoritarian tactics first popularized by Gene Sharp as a non-violent alternative to armed populist revolution, and popularized again in recent books like This is an Uprising and Twitter and Teargas, as a specific model for fighting fossil fuels and climate chaos in the United States. 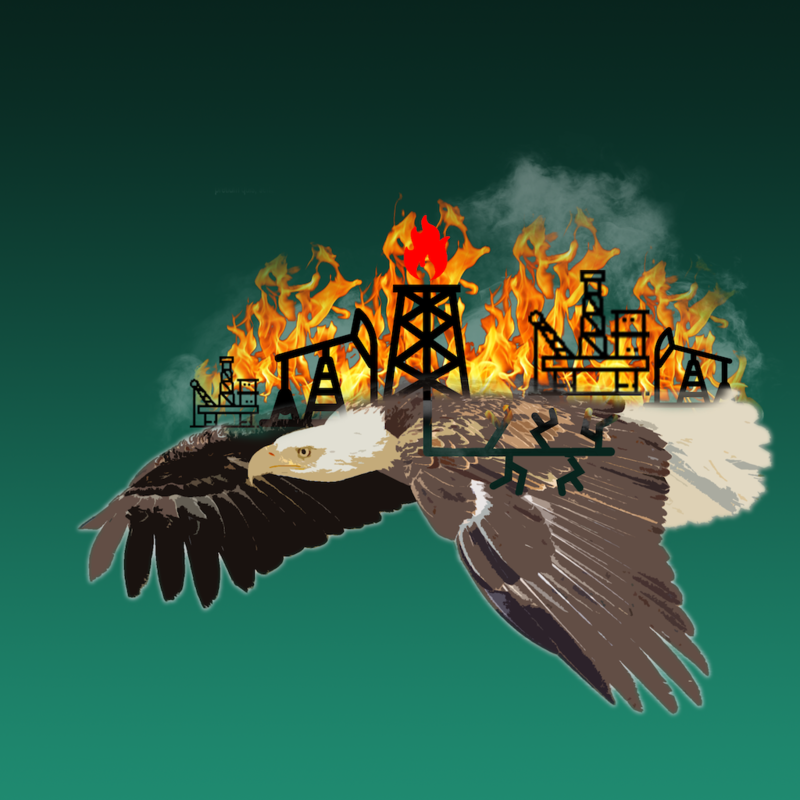 And if you’ve ever questioned if we’re really living in a fossil-fueled oligarchy or dictatorship – just consider the last week of Trump News: His recent Executive Orders basically direct federal agents (that’s the nationalism part) to overrule local objections to fossil fuel projects and disregard shareholder resolutions opposing climate change. Combined with Bernhardt’s dirty, corrupt, partisan confirmation vote, it’s one of the most blatant moment’s of Trump putting the profits of fossil fuel barons ahead of the rule of law, the safety of our communities, and the survival of our climate and common home. If you want to see more about how we’re fighting back this spring – with actions that strike back at the heart of the fossil fuel and pipeline empires in Washington DC, and take the fight to the shareholder meetings and financiers of climate chaos – check out our blog, and stay tuned! 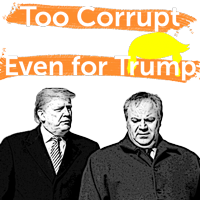 Trump has nominated David Bernhardt to run the Department of Interior, making him the latest in a line of corrupt former lobbyists nominated to regulate the industries they used to work for. This is almost be a cliche at this point: Bernhardt follows Ryan Zinke, who resigned under a cloud of investigations and allegations of corruption. Lobbyist Andrew Wheeler, who thousands of us called, emailed, texted and got arrested protesting was confirmed last month to replace Scott Pruitt – who was forced out over similar corruption charges. But Bernhardt is especially bad – and there’s still time to stop him. At his committee hearing last week, he was questioned strongly by Republicans and Democrats. And his during his previous vote to be Zinke’s deputy, only 53 Senators supported him. But a vote is expected before April 12, so we’re teaming up with a big coalition of groups to deliver more than 150,000 signatures next week. Can you join us and sign on now? Bernhardt intervened to block a scientific report on an endangered species of fish to benefit a former lobbying client who’d paid him $1.3 million. He’s done less than nothing to deal with the culture of toxic masculinity at the Interior Department, where thousands of female employees have reported harassment and intimidation. This isn’t just a case of inheriting a problem from his corrupt predecessor, Christine Lehnertz, the first female superintendent of the Grand Canyon, resigned LAST MONTH after receiving “malicious and defamatory” treatment. It’s doubly tragic because Lehnertz was hired to investigate reports of sexual harassment. Bernhardt is also the chief author of Trump’s radical offshore drilling plan, which would open almost every inch of the US coast to drilling, spilling and exploitation. He’s so integral, the plan is expected to be finalized and made public as soon as the Senate confirms him. During the longest government shutdown in history, earlier this year, while thousands of federal employees were furloughed and national parks filled up with trash, Bernhardt ordered workers to show up and approve 15 new drilling leases on public lands and 71 offshore drilling permits — including 50 for companies that used to pay him as a lobbyist. And that’s not even all – The New York Times, DesmogBlog and other media have practically run out of ink printing stories about Bernhardts corruption and conflicts of interest. Sign now, and we’ll deliver your name along with more than 150,000 others next week before Bernhardt gets a vote! We’ve taken down Trump’s corrupt agents before – firing Pruitt, Zinke, and driving others out of office. We’ve also built a powerful bulwark against his nominees by getting every single Democrat to vote in opposition to Trump’s nominees to FERC and other agencies. But we’ve never succeeded in taking down a nominee at this point in the process. If we stop Bernhardt, we wont just stop a corrupt, misogynist, oil-baron from taking over the Interior Department (though that would be a good thing) we’ll deal a major blow to Trump and Co.’s plans to drill, frack, and mine every inch of our public lands and waters – no matter what the damage to our climate, communities, or people. That’s why it’s critical that you tell your Senators you won’t stand for another fossil fuel industry hack who puts the profits of his former clients above the health and safety of the American people. Bernhardt is a walking conflict of interest. Tell your Senators to oppose his nomination. You remember Andrew Wheeler, Trump’s climate-destroying nominee to be the permanent head of the EPA? Well he’s about to get a vote in the full Senate. I’m not going to lie, it’s incredibly unlikely we can stop Wheeler from being confirmed by the full Senate this week. He was passed out of committee last week on a party line vote – which you helped make possible with calls, emails and action demanding that the Committee Shutdown Wheeler, not the EPA in January. And our outspoken advocacy with Friends of the Earth, already got me and my sister arrested while trying to tell Senators about Wheeler’s crimes. But there’s another really good reason to call your Senator now: Last year, we convinced every Senate Democrat to vote against a Trump nominee for FERC. 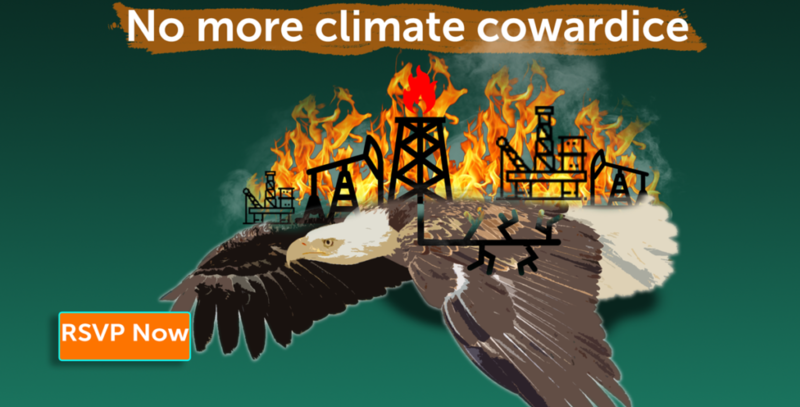 If we can repeat that this week with a vote on Wheeler, we’ll send a powerful message that confirming Trump’s nominees to key posts on energy and environment is a climate crime. And when it comes time to prosecute the Trump team for their corruption, collusion with polluters, and criminal neglect of our climate: this will be important. So call now – click or call (202) 224-3121 and tell them what state you live in. Then, tell your Senators you want them to vote NO on making climate-wrecking coal lobbyist Andrew Wheeler the permanent head of EPA. And don’t forget to call back, everybody has two Senators! Wheeler, you might remember, has spent most of his life as a lobbyist for the coal industry, most recently for infamous coal-baron Bob Murray. And in the few months he’s been “acting” EPA administrator, he’s stopped at nothing to put fossil fuel profits ahead of public health and the health of the planet. While he hasn’t committed the kind of outrageous, headline-grabbing scandals Pruitt was known for, Wheeler is an even bigger danger. In just a few months he’s undermined a critical rule that protects us from Mercury pollution – called the Mercury and Air Toxics Standards (MATS). Mercury, usually emitted from coal burning power plants, is a dangerous neurotoxin that’s especially dangerous for children and pregnant women. Wheeler also rolled back regulations on the super-potent climate-changing chemical hydrofluorocarbons (HFCs). And, perhaps most damning, he’s pushed to ease restrictions on the pesticide chlorpyrifos, and the paint stripper methylene chloride — overruling doctors and scientists who spent years proving that they kill farmworkers, contractors and other workers. 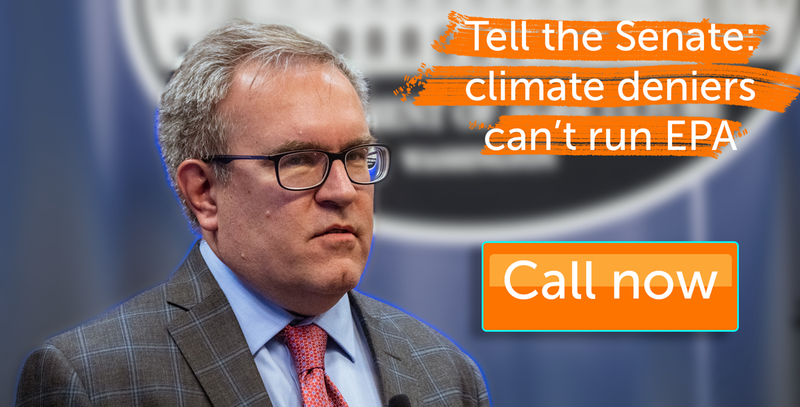 Click or call (202) 224-3121 and tell your Senators you want them to vote NO on making climate-wrecking coal lobbyist Andrew Wheeler the permanent head of EPA. What’s a Green New Deal that doesn’t ban Fossil Fuels? This is getting exciting: In the last week, Kamala Harris and Elizabeth Warren became the latest 2020 Presidential candidates to support a Green New Deal. And rumors are swirling in Washington that Rep. Alexandria Ocasio-Cortez and Senator Ed Markey are about to release a joint resolution for a Green New Deal too. But will these new candidates and resolutions live up to the hype? Will they halt all new fossil fuel extraction, transition to 100% renewable energy, rapidly decarbonize our agriculture and transportation sectors, ensure a fair and just transition led by impacted workers and communities, uphold Indigenous rights, and pass a national jobs guarantee? In short, will the Green New Deal live up to our demands for justice and climate action? They will, if we demand it. Which is why I need your help to deliver our demands for Real Climate Leadership this week. FIRST – click here to see if there’s a Real Climate Leadership event planned near you. If so, sign up to join us. Our cover letter outlining the 5 principles we’re asking all Members of Congress to publicly support. BONUS! Got an extra minute to plan ahead? Click here to add the date and time of your event to our map. Planning ahead for your event will enable our organizing team to follow up with additional support and help you recruit more people to attend. And on a call last week, Sunrise and 350 both defended the idea of focussing on the jobs guarantee, not keeping fossil fuels in the ground or stopping new pipelines. There’s no reason to think any of these politicians and groups – Sunrise, 350, Sen Markey or Rep. Ocasio-Cortez – are trying to sell us out. But until we see the text of that resolution – the way we previously were shown a copy of the draft legislation to create a Select Committee on a Green New Deal – there’s no way to know what it says. *update* And Articles like this more or less confirm we wont like it when we do see it. Because we’ve been burned before: Under President Obama the Democratic party trumpeted an “all of the above” energy policy that sounded a lot like a Green new Deal in its pursuit of 100% renewable energy and a booming economy with no mention of keeping fossil fuels in the ground. That policy directly created the biggest buildout of fossil fuel infrastructure in 100 years – most of it for export. 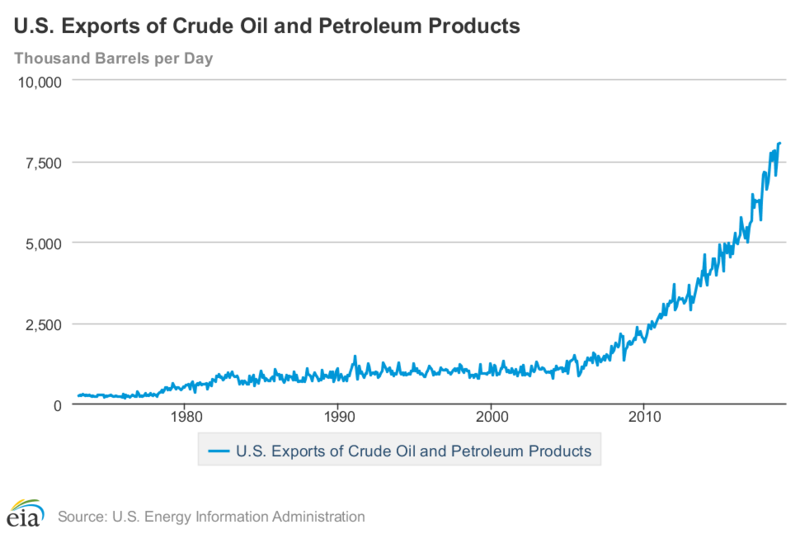 That’s why the US exporters of oil and gas have increased more than 468% since Obama took office. and we’re now one of the largest oil and gas exporters in the world along with (wait for it) Russia. And in specific states like California that have combined bold 100% renewable plans with carbon trading schemes that let bog corporations “buy” offsets in the global south the picture is even darker: The price of 100% renewable in California has been a dramatic expansion of fracking and pollution in poor, often latino communities, and the theft of land from and outright murder of indigenous people across central and South America. Those are the costs of getting climate policy wrong – by endorsing actions that focus on and reward economics and job creation rather than what is truly just or fights the climate crisis. I’m excited about the prospect of a Green New Deal. And I’m encouraged by new leaders like AOC that are talking about the scope and scale of the problem in ways that match the science. But we need to be very careful, right now at the start of the new Congress, that those big ideas and bold demands don’t get coopted into something like an All of the Above part 2. And that’s why out actions this week are so important. By showing up right now and making a clear demand for Real Climate leadership based on these 5 demands, we can make sure that any new resolution or plan is judged against them and can steer the conversation towards solutions we need. Together with more than 50 partner organizations we’re making calls and recruiting volunteers. And Congress and the 2020 Presidential campaigns are already responding. But to make this work, we need volunteers to deliver our demands from coast to coast at EVERY congressional office. I don’t care whether your Representative is a Democrat or a Republican; Whether they’ve signed on to support a Green New Deal already, or are a climate-denying Trump supporter. EVERY member of Congress needs to hear that there are people in their neighborhood these demands, and with your help, we’ll make sure they do. This Wednesday, the Senate is set to consider Andrew Wheeler, Trump’s climate denying, fossil fuel loving nominee to replace Scott Pruitt as head of the EPA. The pattern is clear – every time he’s given a chance, Wheeler puts corporate polluter profits ahead of the health of our people, communities and planet. Sign here to tell the Senate that they MUST reject Andrew Wheeler’s nomination to be permanent EPA Administrator. To add insult to injury, Wheeler’s nomination is being considered in the middle of the longest government shutdown in history – which has left some 800,000 government employees, including most of the EPA, furloughed, or forced to work without pay. EPA staff who are supposed to be out cleaning up toxic pollution, or monitoring for air pollution right now are stuck home, unpaid and forbidden to look for work. And efforts to recover from recent climate-fueled fires and storms in California, Puerto Rico, or Florida is on hold thanks to Trump’s racist, stupid shutdown. For the Senate to even consider Wheeler’s nomination during the shutdown is outrageous. Sign here to tell them. The good news is, we might actually be able to block Wheeler’s confirmation during the shutdown. The Trump team is under fire for prioritizing corporate profits over the public good right now – like how the Interior Department is forcing staff to work overtime to open the Arctic National Wildlife Refuge to oil drilling, even as they fail to pay park rangers to protect rare, endangered Joshua Trees in our national parks. The corruption is so naked now, that three out of four Americans say the government shutdown is “embarrassing for the country,” and a majority of them blame Donald Trump and his team. In response, Democrats are showing more of the backbone we last saw during the hearings on Bernard McNamee, trump’s climate denying FERC nominee. In response to that loathsome nomination, every Senate Democrat voted as a block to stop McNamee’s nomination. If we can deliver that same kind of rebuke to Wheeler, combined with the bad press of the Government Shutdown, it might be enough for Republicans to pull or delay his nomination from the schedule. Sign now, and we’ll deliver your message to Senators on the relevant committee this week. Give us your cell phone number when you do, and we’ll text you updates from his committee hearing, and use our new tools to patch you directly through to the right Senators before they vote. Today is the first commissioners meeting at the Federal Energy Regulatory Commission (FERC) for Bernard McNamee — Trump’s climate denying, coal loving nominee who squeaked by in the closest confirmation vote EVER for a Trump nominee. Our friends from BXE are headed into the hearing room to “welcome” Mr McNamee — and you can back them up by making a quick call! I was one of the tens of thousands of people who called and wrote to the Senate opposing Mr McNamee’s nomination because of his close ties to the fossil fuel industry, and his outrageous statements on climate change and environmental groups. Now that McNamee is at FERC, he must recuse himself from any case involving the oil, coal, or gas industries, or any conversation involving climate change and its impacts on US Citizens. His past comments and work at the Department of Energy, as well as in the private sector, show him to be unfairly biased. I’d like to thank Mr McNamee for making it so much easier to sue FERC. Thanks to his reckless disregard for climate science, clean energy, alternatives to fossil fuels, grid resilience and basic common sense, we have a much better chance of prevailing against FERC in court. Still,I wish he’d just resign so we didn’t have to go through the trouble and expense of suing you every single time. That lead to the unprecedented scenario where every single Senate Democrat voted against McNamee’s confirmation — a feat that has never happened before, not even on the nominations of Scott Pruitt and Ryan Zinke, both of whom have resigned in disgrace since. McNamee’s bias is so blatant that 17 Democratic Senators and Harvard Law School have told him to recuse himself from anything where his impartiality should be questioned. So, while McNamee taking a seat on FERC is bad, it’s also full of conflict, protest and clear conflict of interest – And we can use that. 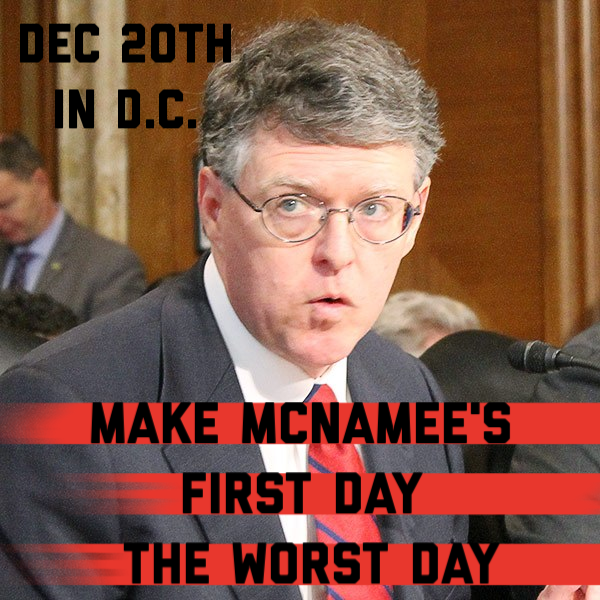 Our friends from BXE will be in the room where it happens today to tell McNamee to his face (they’ll have a report later today on how it went) in the meantime – you can make sure McNamee knows you’re watching by calling his office and making his first day on the job his worst day ever. This week 49 Democrats all voted together to oppose Bernard McNamee – Trump’s climate denying FERC nominee. It might not sound like a big deal, but it really is. Drew explains why in this video and you can chip in to help.